Montana Test.com - Results for: CMMG, Inc ARC-22 AR Conversion Kit 1-25 Round Magazine! 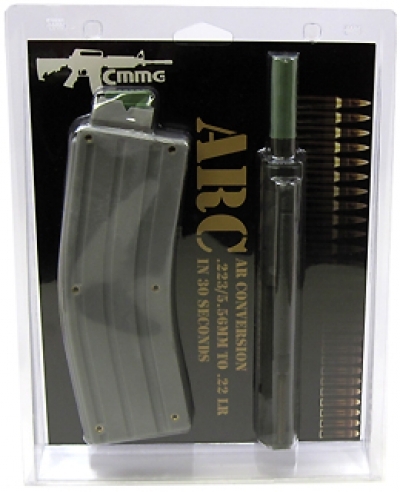 CMMG, Inc ARC-22 AR Conversion Kit 1-25 Round Magazine! The CMMG .22LR caliber conversion is a .22LR caliber rim-fire device which replaces the standard bolt/bolt carrier assembly in the AR15 family of firearms. It allows teh use of inexpensive .22LR ammunition in place of 5.56 (.223 Rem). It is a blow-back operated sub-caliber conversion device that allows semi-automatic firing of teh .22LR high velocity cartridge in the AR15/M16 rifle. The same unit with the addition of the automatic trip and anti-bounce weight (M16 unit only) allows select fire (semi and auto) firing of the .22LR high velocity cartridge in the M16. The CMMG .22LR conversion will not change the mode of fire capability of the firearm in which it is installed.